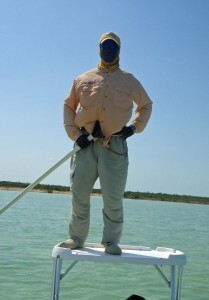 OK… there was a lot of travel to get here, but today was go time… bizness time… bonefishing time. 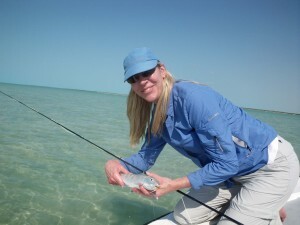 I was paired up with the Outdooress today and with Andros South guide Ellie. Fish were caught. The guide was hooked. 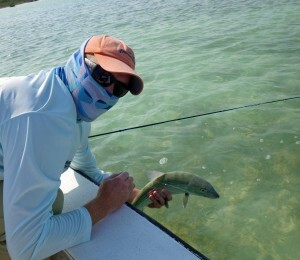 A lemon shark was alllllmost caught. A good time was had. I kind of love this place. 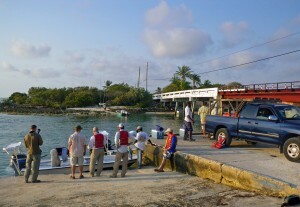 The crew, waiting to get on the water. Ellie, our guide for the day. The skunk is off... first fish of the trip. More will come, but now… Kalik is calling. 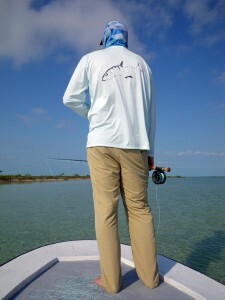 Go to the Michale Gracie blog to see the best bonefish pic you will see this week, or month, or year. 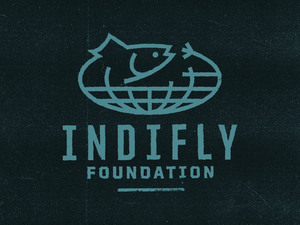 This entry was posted on Monday, March 28th, 2011 at 1:35 am	and is filed under Locations. You can follow any comments to this entry through the RSS 2.0 feed. You can leave a comment, or trackback from your own site. SEEMS LIKE YOU ALL GOT OFF TO A GREAT START, TIGHT LINES AND SCREAMING DRAGS !! What flies were used? Is the guide ok? What happened with the shark? How can I live vicariously with so little information?!? I sure hope you’re tagging those fish! Not yet… but we are going to tag some, don’t worry!